On route to Everest Basecamp, my partner Tom and I were talking about our plans for Europe. The mindless chit-chat was also an easy way for us to forget the numbing cold that was creeping on us. However, right after I said it, I realized that although I had been to the Czech Republic twice by that point, I have only ventured as far as Prague. Following that train of thought, we quickly made plans to visit the country and this time, travel around it. So it was up in the Himalayan mountains when we started naming all the places in the Czech Republic that we wanted to visit. After having just come back from what might be the ultimate road trip across this country, I can truly say that there is so much more to the Czech Republic than just Prague. With that in mind, in this article, I want to share with you all the best places to visit, including an ideal itinerary and the best places to visit. 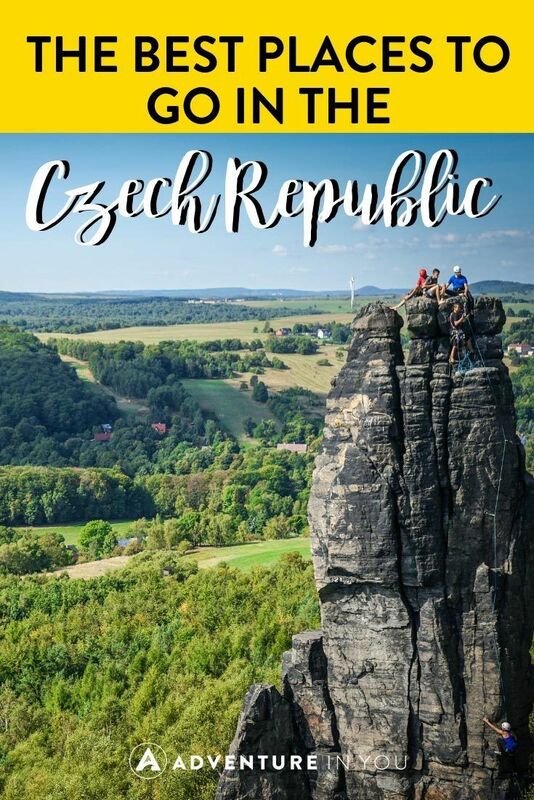 Regardless if you want to travel around the Czech Republic by car or by bus, here are some of the places we recommend visiting including tips on the best things to do, where to eat, and where to stay. Coming up with where to go was easy as there is literally so much to see. Cutting down your list and choosing which places you can visit within a timeframe is the hard part! Geography-wise, the Czech Republic is a small landlocked country surrounded by Austria, Germany, Slovakia, and Poland. The country is made up of 8 regions and is generally very easy to travel around regardless if you opt to rent a car or take public transportation. 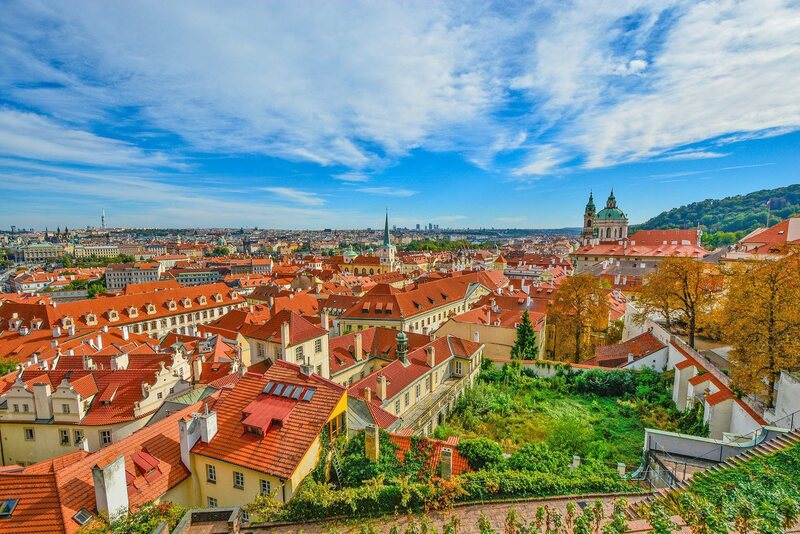 Naturally, the city of Prague is first on the list, mainly because it is the capital and largest city in the Czech Republic. If you are coming from another country, most likely, Prague is your first point of entry. Having explored the main attractions of the city numerous times before, we opted to go local and just eat and cafe-hop our way around town. Although I love Prague to bits, it is quite touristy. Our tip? Go off the beaten path. There are heaps of off-the-beaten-path neighborhoods like Vinohrady and Žižkov or Letná and Holešovice with loads of great coffee shops, cafes, and restaurants. If it’s your first time in the city, visiting the Prague castle, the main town square, and Charles Bridge are part of the usual tourist routes. However, if you’re interested in exploring a few of the best viewpoints overlooking the city, Hanavský Pavilon and Petřín Tower are two of our favorite spots. Naturally, with such a popular tourist destination, there are heaps of places to stay. 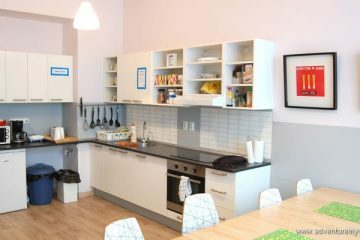 Take a look at our full guide on the best places to stay in Prague. Coming from someone who has been to this city multiple times, there are LOADS of options on where to eat. Generally, though, I would avoid the places in the Old Town square as they tend to be overpriced. 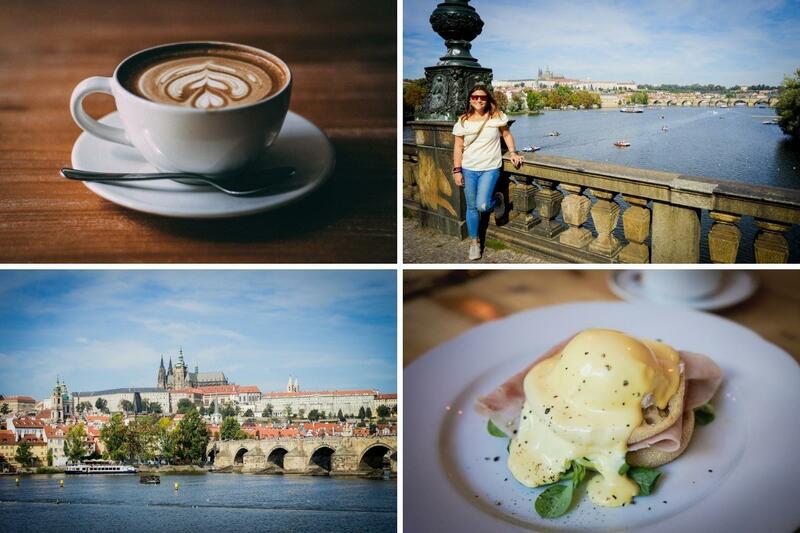 If you’re a foodie like us, consider checking out this Prague-based food blog for local recommendations on where to eat. Their article on where to get traditional Czech food in Prague is spot on. Located only 2 hours away from Prague is the town of Špindlerův Mlýn which is part of the Krkonoše mountain range. Krkonoše National Park is home to the tallest mountain in the country, Sněžka, otherwise known as Snow Mountain which sits at 1602 meters high. Although it is popularly known as a Winter destination thanks to its large snowboarding and skiing scene, the fun and action continue here all year round. We decided to spend two days here and in those two days, we did not run out of things to do! During the Winter time, I honestly think you can spend a week in this city without getting bored. The pathway during our 20km hike up Medvědín mountain. As mentioned, this town is a big Winter destination due to the popularity of skiing and snowboarding. We went right as it was leading up to fall and still had a blast. I highly recommend taking the cable car to Pláň to enjoy a panoramic view of the city. They also have a great little cafe where you can have coffee and desserts. During our time there, we went downhill mountain biking with the guys from Skia Real and found their website to be a pretty good resource of things to do in the area. As we wanted to hike around the mountains, we connected with Yellow Point, a local adventure company who took us hiking up Medvědín mountain and downhill scooter riding. We also had a go at their bungee-like Giant Swing. On our way to our next destination, we also dropped by Farma Hucul to go horseback riding. This was one of our favorite activities as we rode through a local misty forest, making the whole experience feel like we were walking through a storybook! For those who want to do something unusual, a detour to Rautis may be worth your time. This company is visited by many as they are one of the only remaining glass-beads hand manufacturers who create Christmas ornaments. During our trip, we stayed at Aqua Park & Hotel Spindl. If you are traveling as a family, this place can be a good pick as it has a waterpark within the premises as well as spa facilities. For couples looking for something a little bit more romantic, Hotel Grand had beautiful rooms overlooking the mountains. While in Špindlerův Mlýn, we ate at Restaurace v Uličce which served us probably the best mushroom soup EVER. This place is highly recommended. 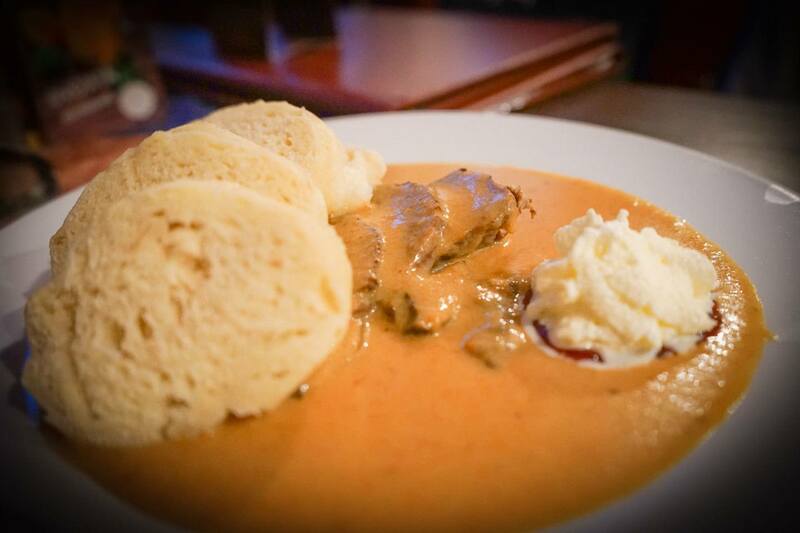 If you head up Medvědín mountain, Labská Bouda is a great place to stop and have food. After our horseback riding adventure, we also ate at Chata Tereza, a charming mountain lodge which served traditional home cooked food. Popularly known in Czech Republic as Český ráj, is a UNESCO sandstone GeoPark and was actually the first ever nature reserve in the Czech Republic. 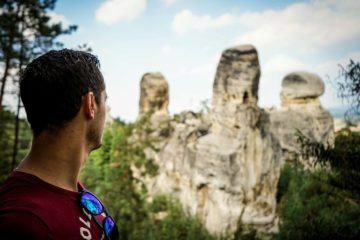 Not only is this area known for its beautiful castles, pine-laden forests, and incredible (yet bizarre) rock formations, it also has a few historic landmarks which is why for years on end, it has attracted poets and artists. During our time there, we focused mainly on the land protected nature reserve and found ourselves getting lost in the labyrinth of rocks and beautifully covered foresty areas. We started off by exploring the popular Rock Castle of Vranov. From the parking lot, its a short walk to the top through a beautiful forest covered area. As soon as you reach the bottom of the castle grounds, it is a steep ascent through the rock castle, navigating through narrow passageways and staircases. 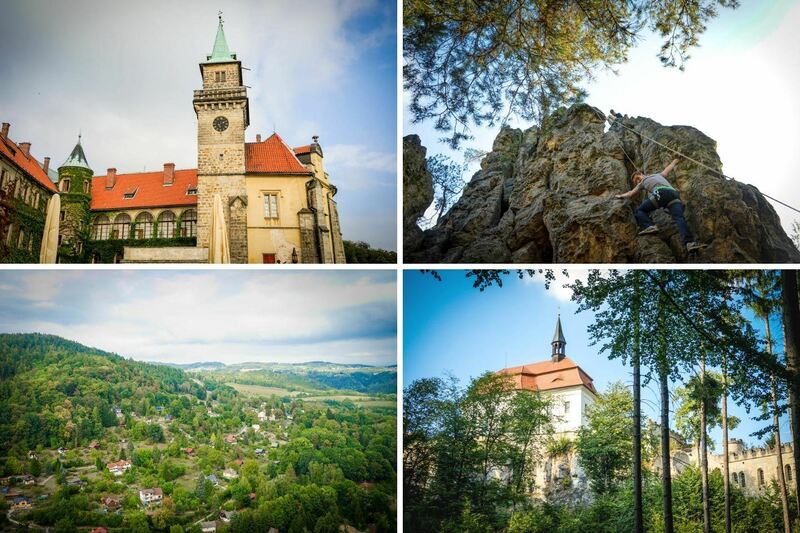 However, as soon as you get to the top, the view of the surrounding towns and the Jizera River are 100% worth it! Another castle worth exploring is the Hrubá Skála castle. From this castle, there are tons of various hiking (and biking) paths that vary in distance. We opted to take the yellow trail Castle Valdštejn then the red trail all the way back. The walk was stunning and was one of our favorite moments during the entire trip. Not only is this trail super easy and well marked but it also takes you through some incredible viewpoints where you can see the famous Hruboskalsko sandstone rock formations. 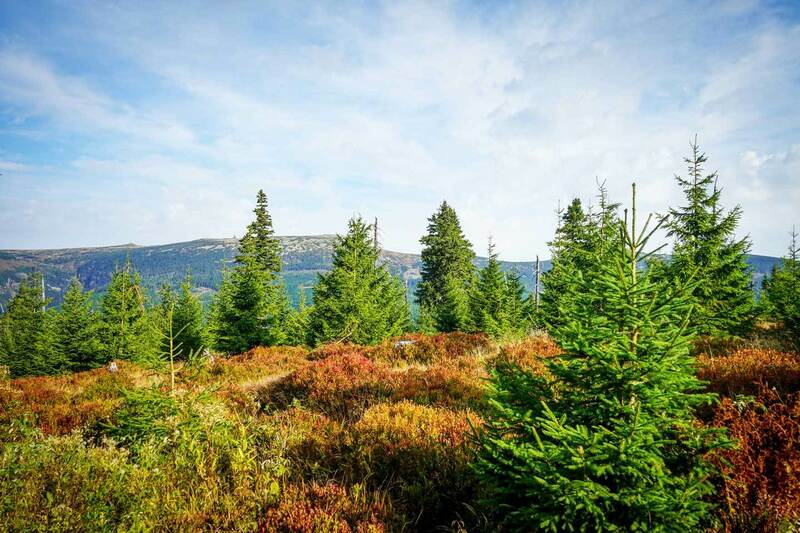 While the land protected area in Bohemian Paradise is popular during the summer season, visiting here during the Autumn/ Fall season is also recommended. During our time there, we hardly had anyone else on the trail, only adding to its overall appeal. Apart from hiking, rock climbing is a pretty popular activity here and is something we recommend trying. Tom had a go scaling a few rocks by Malá Skála and had an absolute blast scaling these sandstone formations. If you want to make your childhood dreams come true, you can opt to stay in a real life castle by booking a room in Eu Chateau Hotel Hruba Skala. If you’re basing yourself in Turnov, we recommend staying at Hotel Karel IV. We also met a local who ran a lovely guesthouse right by the center. 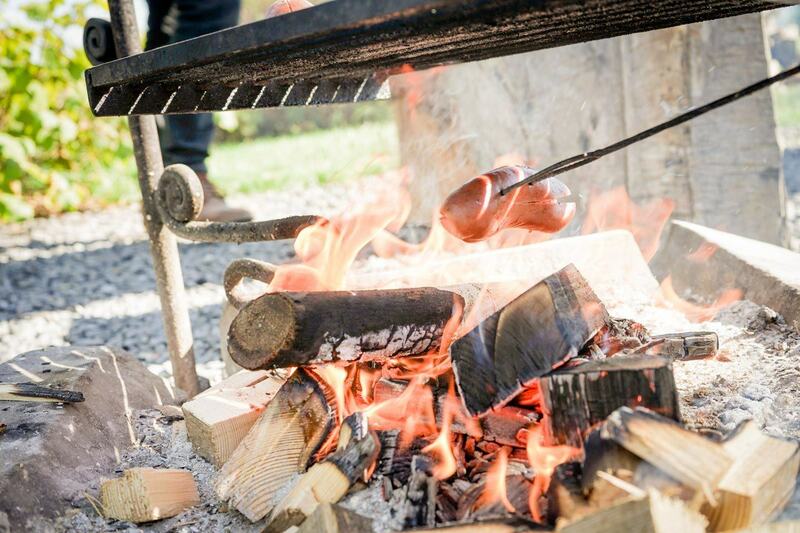 During the days where we were walking the trails, we opted to go for quick street food of grilled kielbasa and warm bread which can be easily found in roadside stalls around the main tourist attractions. Up to the end of our trip, Tom swears that the best svíčková (beef with cream sauce) that he’s ever had was from Hotel Restaurant Skála. Believe me, this was his favorite Czech dish so he ordered it in almost every restaurant we went to! We also ate in the restaurant right by Hotel Karel IV and was pleasantly surprised by the quality of the food- well worth a visit if you’re in Turnov! The winning svíčková dish out of our entire trip. At this point, we were already four days into our road trip and have been blown away by the scenery so far but nothing could have prepared us for the beauty of Bohemian Switzerland. Every single viewpoint and hiking trail wowed us one after the other. 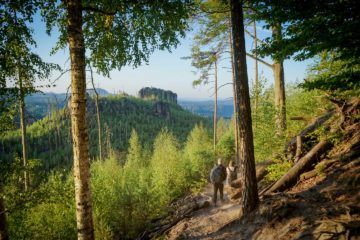 Bohemian Switzerland National Park is every outdoor enthusiast’s dream come true. 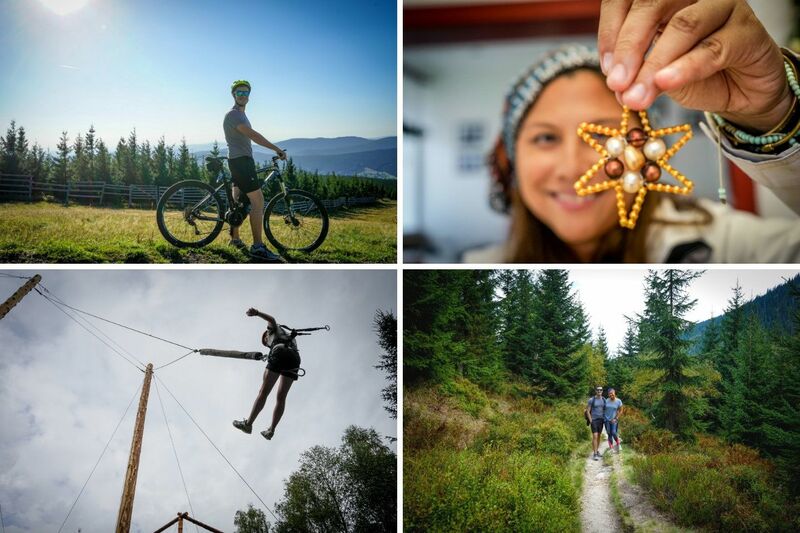 Made up of steep ravines, incredible canyons, and deep forests, it is one big adventure playground and is the perfect place to explore the many hidden natural beauties of the Czech Republic. To gain local insight into this place, we collaborated with Northern Hikes, a local-owned tour company who specializes in tours in the Bohemian Switzerland region. We were lucky enough to experience the newly launched Coffee and Canyons tour with Northern Hikes which essentially combines two of our favorite things…coffee and the great outdoors! Partnering with a local coffee house, Bohemian Coffee House the team at Northern Hikes took us to some incredible locations where we got to enjoy a warm cup of coffee set amidst rolling forests and steep canyons. It was pretty special! 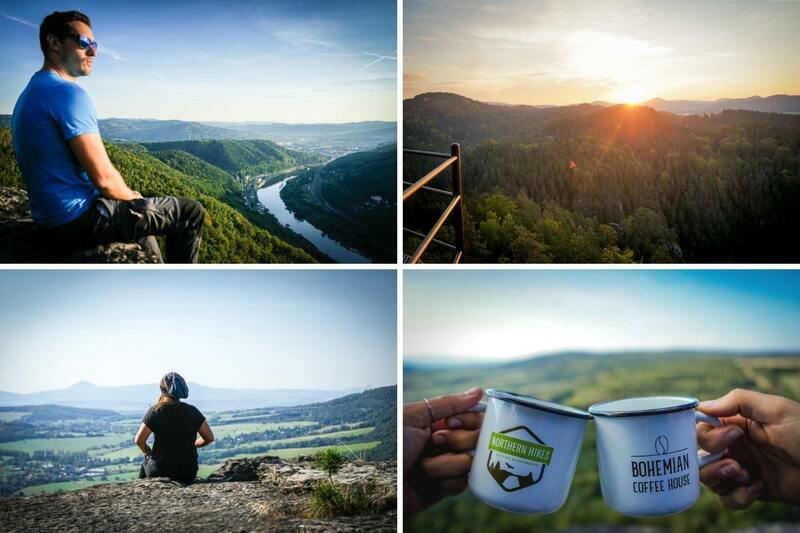 Our sunset coffee session by Rose Ridge overlooking the stunning Elbe River Canyon is something we will always remember. 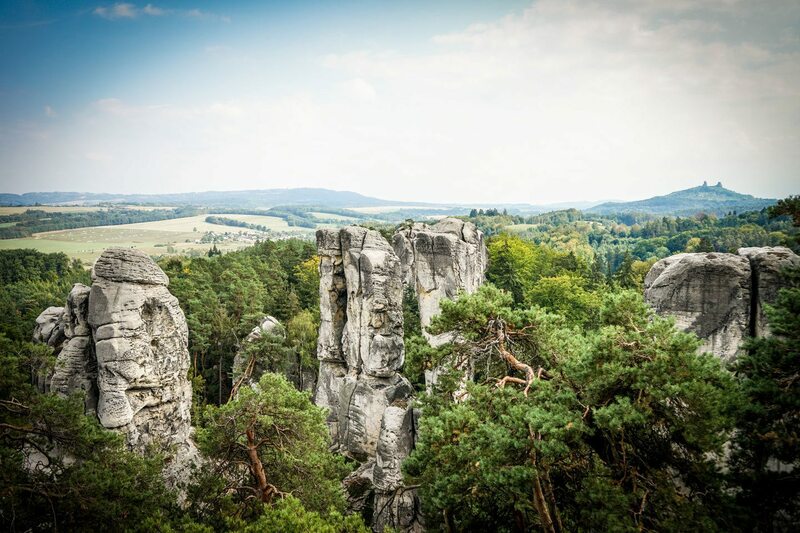 A few of the famous things to do in Bohemian Switzerland include visiting the Tisa Rocks which were made famous after being featured in Chronicles of Narnia. During our time in Bohemian Switzerland, we also woke up early to catch the sunrise at Mariina Skala viewpoint which is along the Jetrichovice viewpoints trail and while the steep climb was pretty intense (especially in the cold), the panoramic view from this spot was phenomenal. 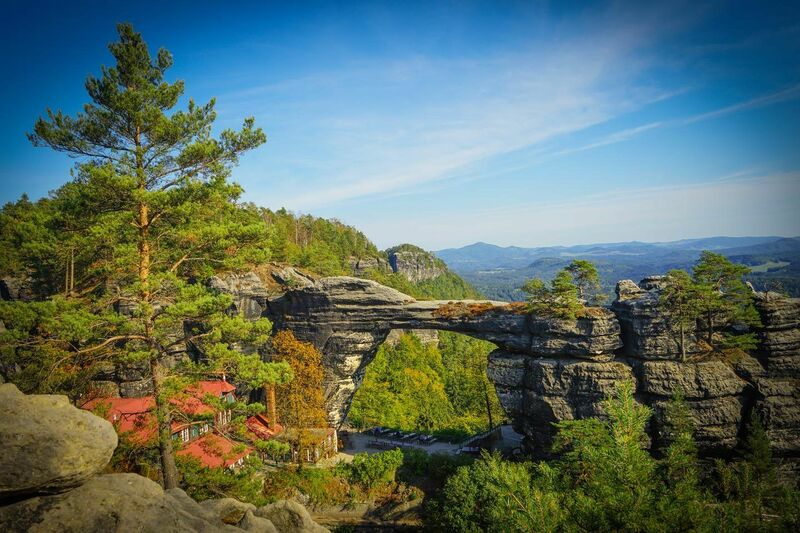 Similarly, one cannot leave Bohemian Switzerland without seeing the famous Pravcicka Gate which is the largest sandstone arch in all of Europe. The sheer size of this arch alone is enough to make you stop for a second to take in the scenery around you. Last but not the least, we also recommend visiting Soutěsky Kamenice – The Gorges of Kamenice. I swear it was like a scene from a movie when we floated down the Gorges on a small boat. All of us were simply looking around and enjoying the scenery when our boat captain started playing the harmonica. Suddenly, a bird swoops in and takes a dip in the water, a small waterfall gushes alongside the gorge and the sun, dancing and glimmering in the distance. It was magical! If you’re looking for a unique experience, why not stay in a brewery which is exactly what we did while we were in Bohemian Switzerland. We spent one night in Falkenštejn Hotel and Brewery (whose local brews I can highly recommend) and another night in Na Stodolci. Na Stodolci is a quaint farmhouse which has rooms and a restaurant which offers incredible farm to table food. We stayed in one of their family cabins with fellow travel bloggers, Megan and Scott from Bobo and Chi Chi and had a blast! During our time in Bohemian Switzerland, we ate so much good food (and drank so much good beer!). Some of our recommendations include the self-catering restaurant, Lucni bar (Meadow Bar). This unique restaurant concept allows you to simply take what you want from their picnic type spread and list what you consume. Right after our sunrise hike and a walk through the gorges, we headed here and grilled our own sausages and had a feast for brunch! 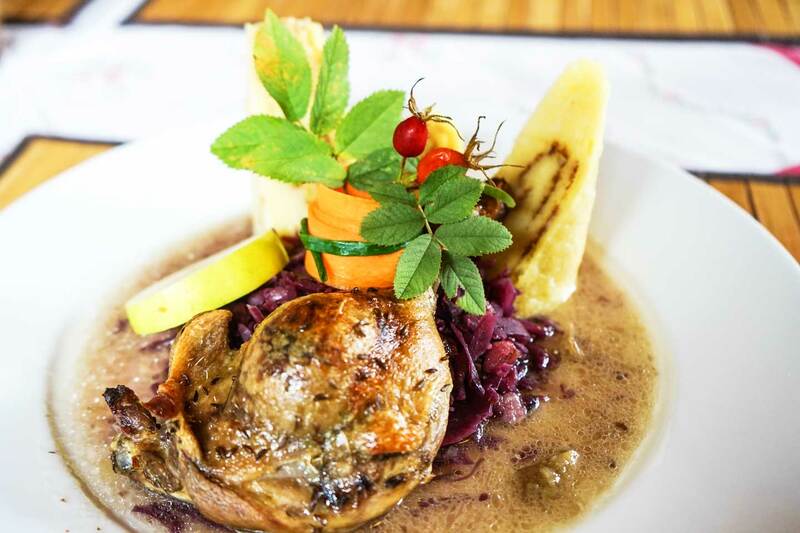 Other restaurants worth checking out are Refugio and U Fořta. As mentioned, Na Stodolci also offers food which we tried for dinner. Everything that we ordered was freshly cooked and delicious, with the local ingredients really being the star of every dish. If you decide to stop by, don’t forget to order the special beer brewed by Falkenštejn brewery just for Na Stodolci. What I loved most about this area of the Czech Republic is how all the small local business work together to promote their own products. Most of the places we visited sourced their coffee from Bohemian Coffee House, beer from Falkenštejn, and produce from surrounding farms and markets. 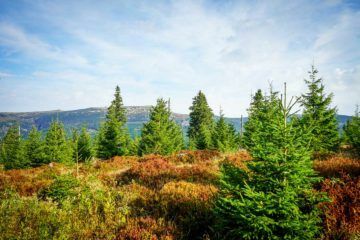 Coming from someone who loves supporting local business whose work ethic aims to promote sustainability, I love this movement amongst the business in Bohemian Switzerland. The city of Liberec is like the smaller and hipster cousin of Prague. Although its a city, it has a small town charming feel and is still surprisingly surrounded by nature. Our time in Liberec came as a welcome treat after having spent the last few days hiking and adventuring around. This city sits by the foot of the Ještěd Mountain and is slowly turning into one of the best-hidden gems in the Czech Republic. Apart from beautiful architecture, the best part about Liberec (in my opinion), is the rise of young hip cafes and restaurants all over the city. 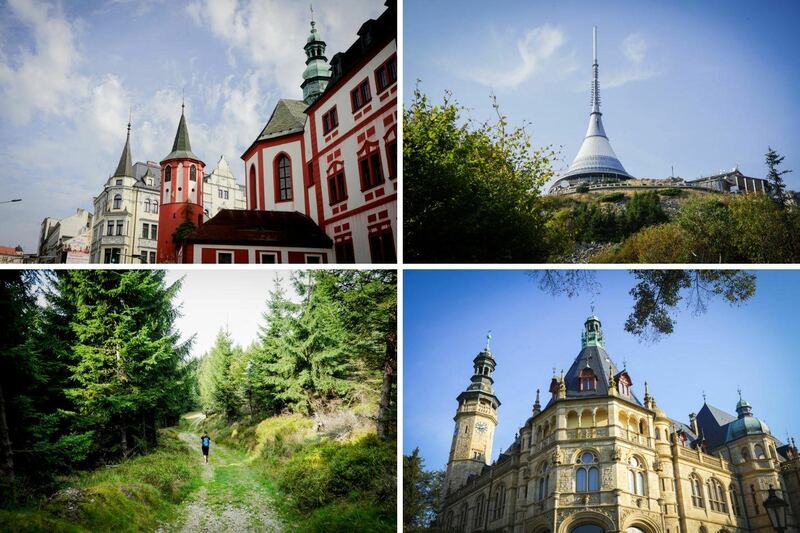 As we were only in town for two days, the tourism office of Liberec filled us in on the best things to do in the area. The Old Town Square where the City Hall is located is a good place to start. 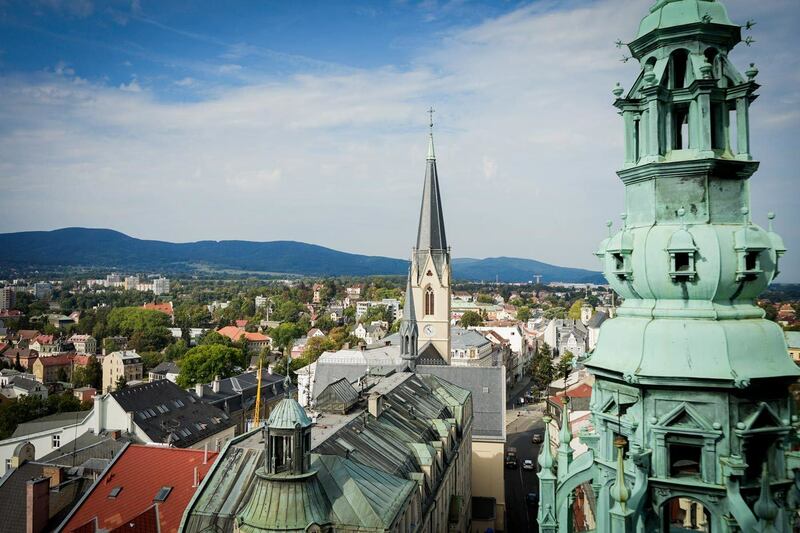 Here, you can marvel at the wonderful architecture and take in the panoramic views of the city from the town hall. When we were visiting, Spiderman was being filmed right by the town square which blocked a large part of the main area. Nevertheless, wandering around the buildings was pretty fun. Apart from this, the next best thing to do is to take the cable car up the Ještěd Mountain. Right at the top is a tall tower which they call the Ještěd Tower. This building is a TV tower, restaurant, and hotel all combined into one and offers the best views of the city. If you’re feeling adventurous you can also hike back down from the tower. Once you’ve finished exploring the fabulous city sights, you can also opt to take on a via Ferrata course right in the heart of the city. This little oasis was located at the back of apartment buildings and used to be a garbage dumpsite. Thanks to the perseverance and passion of a few local climbers, they cleaned up the place and created a space where people can climb, practice yoga, and just come together. We spent an afternoon there and had a blast! We ended the climbing session with some grilled sausages (Špekáčky) and had a blast. During the Winter, the entire place turns into an ice climbing arena with routes perfect for beginners and intermediate climbers. We stayed in Pension u Muzea who had the most lovely staff. If you do decide to go, the hotel is equipped with a wellness center which was just what we needed after spending nearly 6 days hiking and walking. Highly recommend it! We made the most of the fact that we were in a city which meant we tried a lot of new brunch and dinner places during our time in Liberec. 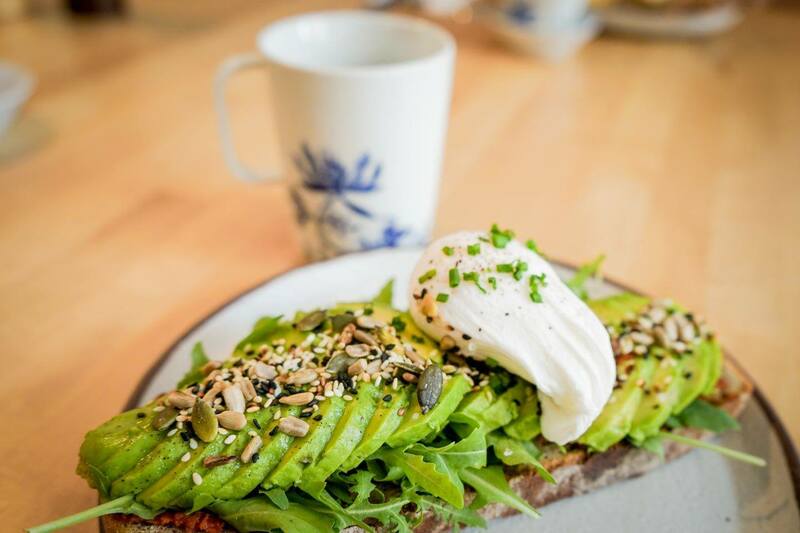 We ate brunch in two hip cafes which had delicious flat whites and fantastic food. One was Bistro Mikyna and the other was at Bistro Široká. For dinners, we recommend visiting Beerwarehouse and Zoo 1320. Not only did it have good food but the service as well as the unique retro style interiors. While the places listed above where the ones that we visited during our 8-day road trip, there are loads of other cities, towns, and regions we would love to visit. After experiencing the beauty of the country (not to mention the delicious food and beer), we know a road trip to explore the other parts is something we will be doing again in the near future. Here are a few places that are on our list to visit for our next trip. Because we wanted to see and do as much as we can during these 8 days, we spent our time doing a lot of activities so I recommend you choose one for the day and spend the rest of your day enjoying and exploring. Overall though, our trip to the Czech Republic was something for the books. I am SO glad we decided to go and explore more of the country. Between the incredible scenery, delicious Czech food (and beer), and the warm hospitality that the people we met gave, we are definitely planning another trip back. Footnote: We had partnered with the Czech Republic Tourism Board for this trip but as always, our opinion is our own! Looking for more articles on the Czech Republic? Take a look at a few of our best ones!